Any idea how the previous owner reefed this? There's nothing to attach the cringle to. I suppose you could run a knotted line through the port side and tie it to the cleat on the starboard side. I was thinking about making a floppy ring in each cringle, maybe just have a line tied to the cleat with a hook or snap shackle on it? Trying to keep it simple. On the end of the boom, there's a pulley mounted on a track with a line leading to the first cringle back there. Again, what did they do for the second reef? 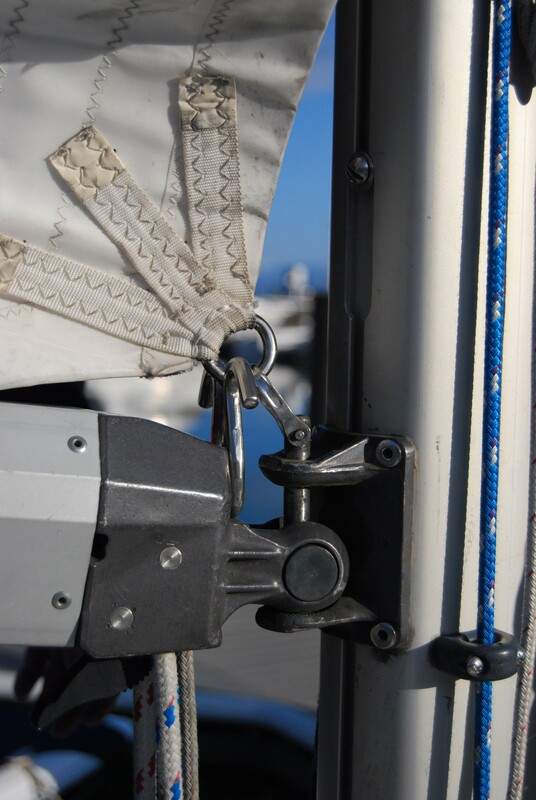 Don't know about PO But if it was me I think I'd tie a stopper knot in a line, run it through the fitting on the port aside, then a through a reef I got hook http://www.go2marine.com/product/229...voKxoCGlvw_wcB and tie off at the starboard cleat. Lower sail put hook through crinkle raise adjust clew done. For second reef lower sail remove hook put in second reef crinkle adjust clew. Of course you could also have two hooks. Re: Any idea how the previous owner reefed this? Again, what did they do for the second reef? Use the lines for the first reef. I'd just tie a line to the SS loop below the boom and run it thru the cringle to the other side to a cleat. Having the line double like that helps to keep the slide in the track from cocking and resisting coming down when you use a knot and have side pull. I was talking about the line at the end of the boom for thst part. I like it. No hardware to buy. My C-30 (1980) has a hook on the gooseneck to put the reef cringle over, and a line on the leech cringle. It's kinda a PITA to use, one of these days I'm either going to convert it to single-line or get a dogbone for the luff cringle. Yeah, mine is missing that hook. So how do you do a second reef on the leech with just that one line there? The horns are just an option. One can simply tie the point round the boom and mast. A piece of rope does the trick. Do a search under "reefing". This has been covered 5x+ in the last week alone. To include pics, info links, descriptions, hardware rec's, cordage rec's, etc. Do a search under "reefing". This has been covered 5x+ in the last week alone. I have. Didn't see my question asked. It's covered. I addressed similar directly myself, as did a few others. 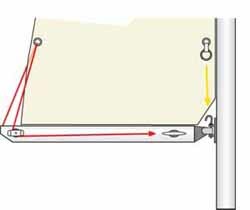 Including a picture in a linked article in Cruising World magazine on reefing by Bruce Bingham. He describes the reefing setup on his Cape Dory 28 IIRC), & how it won them races. My halyard is at Mast, so I installed a double block near the gooseneck, ran two lines from aft end of boom, through leech cringle, forward to the block(s), up through reef cringle down to the cleat. Maybe the search engine doesn't work, because a search for reefing brings up this conversation only. But what I asked for, was how did you think the previous owner did any reefing on a boat that's not set up for reefing. I'd run a line from the padeye (or loop?) that's under the gooseneck, through the reefing cringle and down to the cleat that's shown. It's very similar to what's on my boat, except there's a dedicated padeye and cleat. Make the line long enough so it can be left through the first reef cringle and cleated to hold it in place even when the sail isn't reefed. You can use this one line for all reefs.